Facebook has published a new study which examines the effectiveness of traditional video approaches – i.e. TV ads – when looking to reach modern, mobile consumers. Working with Metrixlab, Facebook commissioned a study of some 759 video ads from 300+ brands, across nine verticals, and distributed across 25 countries. The researchers surveyed video viewers to get their responses on brand recall, then collated them relative to each approach. The first area they looked at was brand recall, separating the video approaches into three distinct categories. As you can see, ‘Traditional Narratives’, the kind you’d see on TV, performed worst for brand recall, which Facebook suggests may be because ‘just 38% of videos from this group showed the brand in the first seconds’. 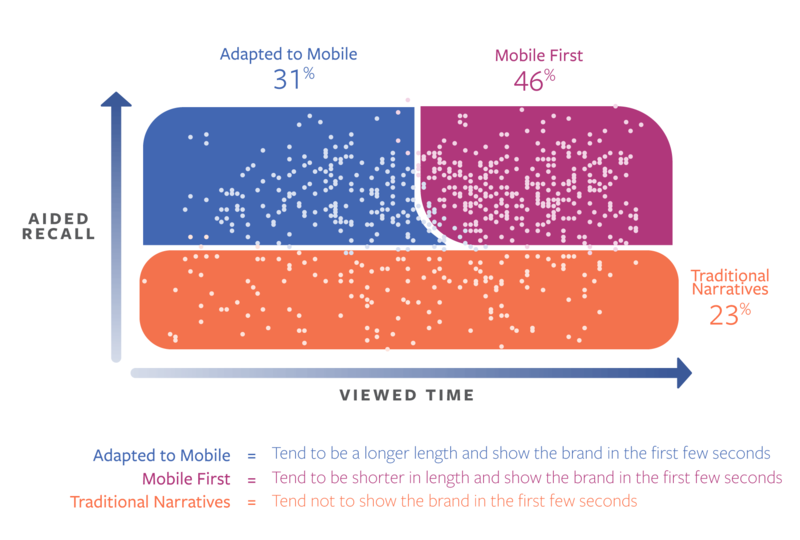 This is a key best practice for mobile video, which is further underlined throughout the study – creating for mobile means establishing your brand presence early on, in order to solidify your messaging. Further underlining this, Facebook also found that brand presence in the first seconds significantly improved aided recall. But its more than just having your brand front and center, the researchers also found that the type of branding plays a role in recall. Weaker branding was found to be more prevalent in adapted videos, as opposed to those created specifically for mobile, while the researchers also found that adapted videos tended to be longer, more in-line with traditional ad length, which is not as effective as shorter messaging for mobile users (‘the longer the video, the lower the percentage viewed time’). Indeed, in their final observation, the research team also noted that shorter, mobile first videos clearly performed best. The findings underline that mobile video requires a unique approach, you can’t necessarily rely on traditional video techniques and port them over. By keeping in mind the core elements of mobile video, you’ll be better placed to create more effective ads, which will boost reach, appeal and performance. You can view the full Facebook ‘Stand Out in Feed’ report here.